Do you love the flavor of a slow cooked pasta sauce but don’t want to take the time to wait for it cook over the stove? This is the recipe for you as you actually do all the prep but then place it in the oven. This is why I love Ina Garten and Barefoot Contessa recipes so much. 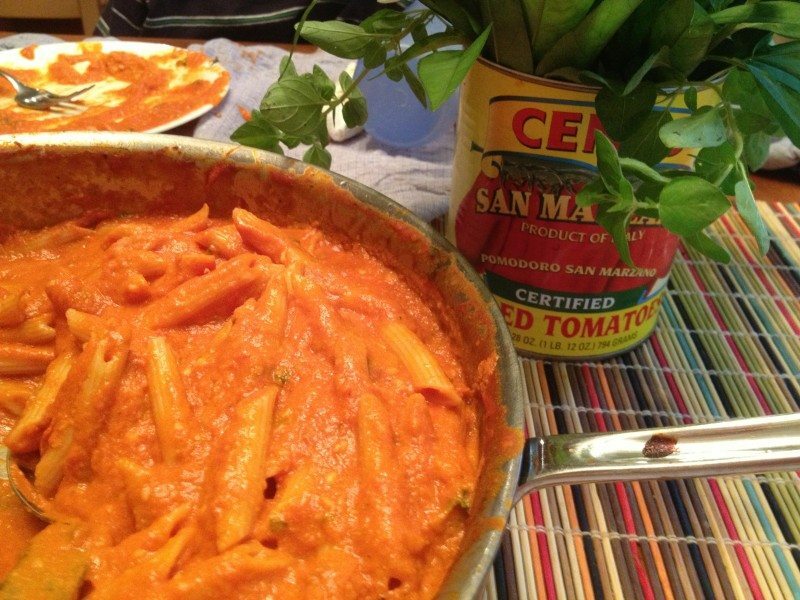 My family adored this Penne with Vodka Recipe and now worries the alcohol gets burned off. Plus be sure to read the whole post to see what I did with the Tomato Cans as decor for the Italian Themed Dinner. 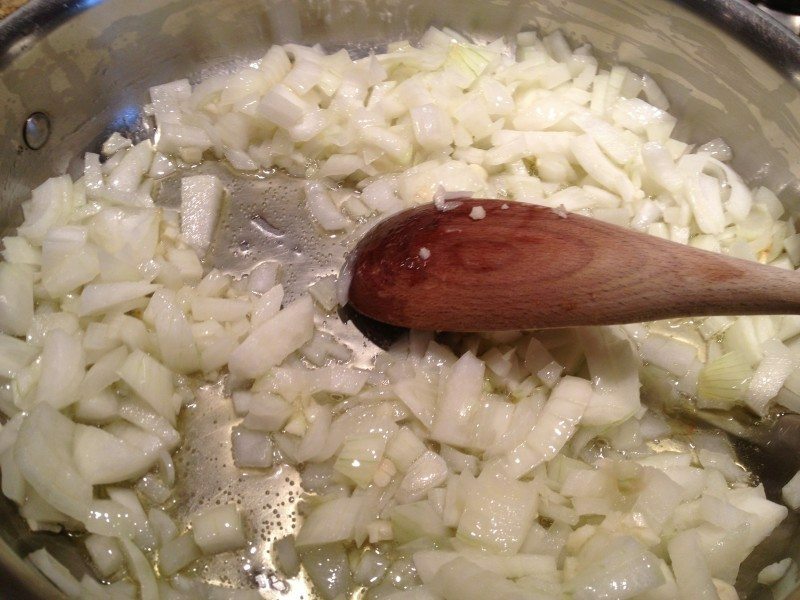 Your kitchen will smell amazing with the smell of cooking onions, and really this is all the cooking you will have to do. Add a good vodka to your recipe, even though it burns off the quality of the vodka is what you will be tasting in the final dish. Then add the best Peeled tomatoes you can afford. 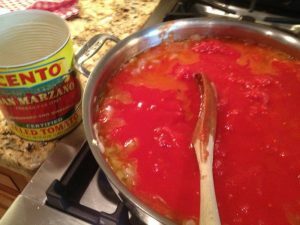 I love using Cento tomatoes one for flavor and also I love the can label. Stay tuned to see why. Now you are ready to put the pan in the oven and just let the magic of the flavors meld together. Time to grab yourself a glass of Italian Wine or something and kick up your feet. Well for a while, you need to heat up the water for the pasta. Add your cheese and a little more oregano for color. YUMMY. There is plenty of sauce to go around. 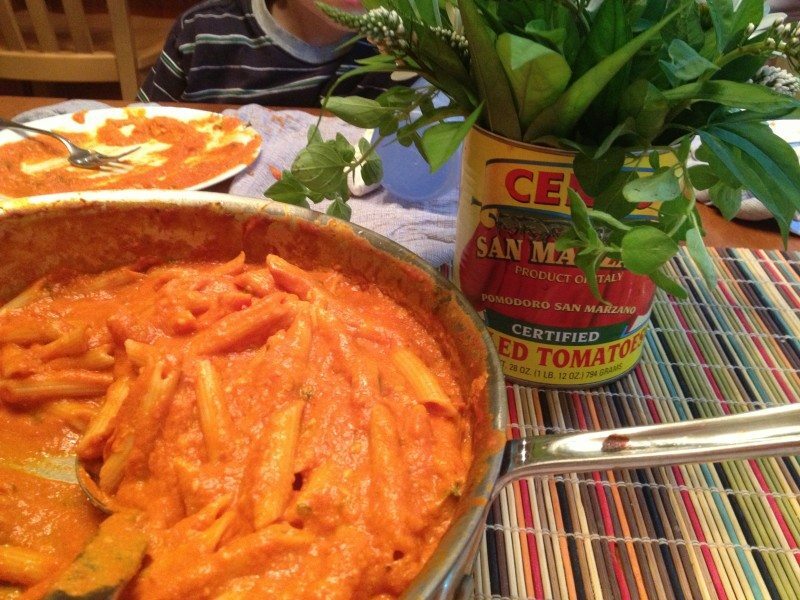 Keep your tomato cans and fill them with some flowers to set the theme for this Italian themed dinner of Easy Penne with Vodka Sauce. 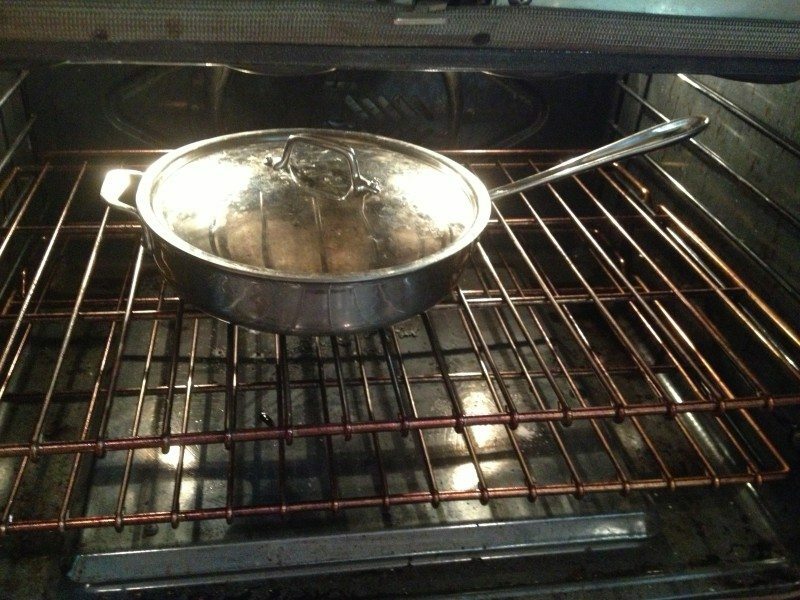 Heat the oil in a large (12-inch) ovenproof sauté pan ( I use All-Clad Pan) over medium heat. Add the onions and garlic and cook for about 5 minutes, until the onions are translucent. Add the red pepper flakes and dried oregano and cook for 1 more minute. 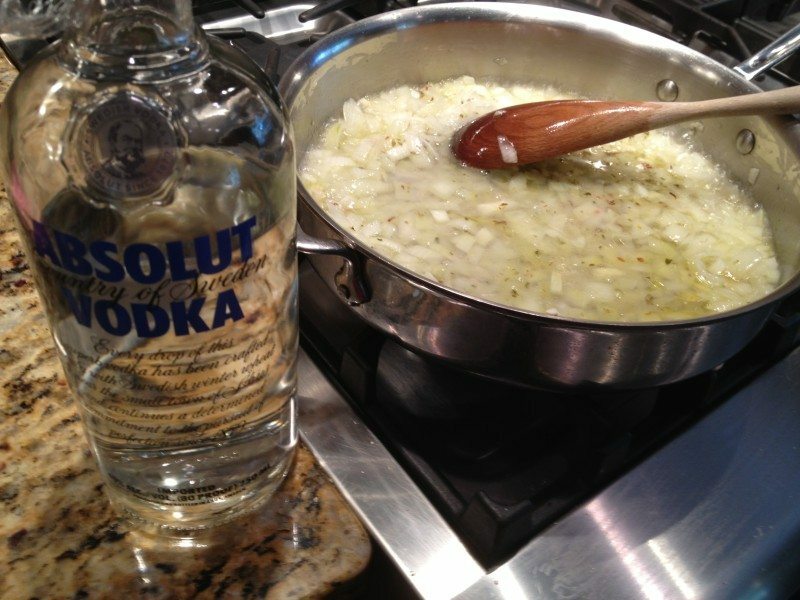 Add the vodka and simmer for 5 to 7 minutes, until the mixture is reduced by half. Using clean hands, crush each tomato into the pan. Add 2 teaspoons of salt and ½ teaspoon of black pepper. Cover the pan with a tight-fitting lid, place in the oven, and bake for 1½ hours. Bring a large pot of water to a boil. Add 2 tablespoons of salt and the pasta and cook according to the directions on the package. Drain and set aside. Two cups at a time, carefully pour the tomato mixture into a blender and purée until smooth. Return the tomato mixture to the sauté pan (be careful; the handle is hot!). Add the fresh oregano, cream, 1 teaspoon salt, and ½ teaspoon pepper and simmer partially covered for 10 minutes. Add the pasta to the sauce and cook for 2 more minutes. Stir in ½ cup of the Parmesan cheese and serve hot sprinkled with extra Parmesan and fresh oregano. What will you serve with this Penne with Vodka Sauce Dinner? I’ve never cooked with vodka before, but penne with vodka sauce is one of my favorite dishes to order at my local Italian restaurants. My husband i sthe one who makes all the pasta dishes. I will give him this recipe. My husband really loved vodka sauce! Looks easy enough for me to make! We love pasta sauce, and it is true, waiting for it to slow cook is not always easy. We love to serve ours with a fresh green salad and of course garlic bread! I love Vodka sauce but I always buy it premade. Thanks for sharing this recipe as it looks delicious and easy to make. :Penne is one of my favorite types of pasta. I like the bite in it (a little firm, not at all too soft). Your recipe sounds good. I love penne, but never tried vodka sauce before. This looks great! This looks absolutely delicious and so easy! I think you just picked what we’re having for dinner! This looks and sounds so good. I am going to have to try making this for the family. Thanks for sharing. I love rosee type sauce – it looks delicious! That looks really good. Good job using a quality vodka. When cooking with alcohol, if you wouldn’t drink it, don’t cook with it. I’ve never actually seen how it is made. Love the step by step process and pictures. Looks delicious, I love how thick the sauce looks! This is one of our families favorite dish.. never though about the slow cooker way. That looks so good. I haven’t had Penne with Vodka Sauce in a long time. I love this idea of using Vodka! Sorry but vodka makes everything better! I pinned this to my FOODS-Foodie Inspiration Board. I will have to try this out! 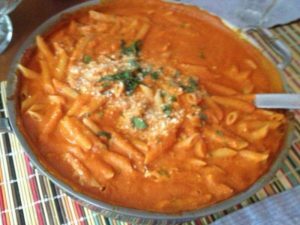 I love Penne with vodka sauce and this recipe looks great. Love topping with fresh Oregano!